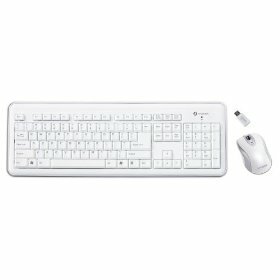 The RF-6577L wireless keyboard and mouse combo uses the latest in 2.4GHz RF technology to provide you with extended range and flawless communication with your computer or HTPC. 8,388,608 unique frequencies eliminate interference while maximizing the range of the keyboard. The comfortable scissor structure keys allows for faster and quieter typing, and space saving nano dongle stored inside of mouse allows for easy travel. The mouse has two sensor sensitivity settings: 800/1600 dpi. The keyboard is spill safe, and is compatible with PC. 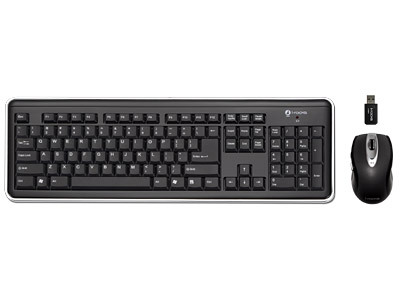 This keyboard is the ultimate wireless keyboard set for the casual user or the extreme gamer! 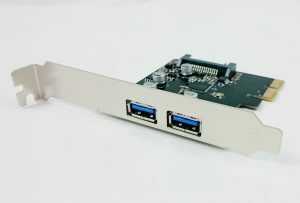 Ideal for home entertainment computer and meeting room presentation tool. Comfortable scissors-structure key-switches architecture for faster and quieter typing. Two conveniently located side-buttons allow you to easily go back and forward in your web browser. Unique and ergonomic shape for maximum comfort and also has easy to hold rubber coated side grips. On/off switch to maximize battery life. Two user settable sensor sensitivity settings – 800 and 1,600 dpi resolutions. 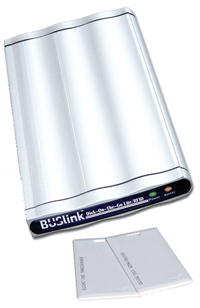 Wireless Effective Distance Up to 32 feet.